Weddings have so many traditions a bride feels they should up hold. The father walking the bride down the aisle, seeing the groom before the wedding and lighting the unity candle during the ceremony. All of these are traditions people don't want to break in a wedding but here at You're The Bride we say why not! 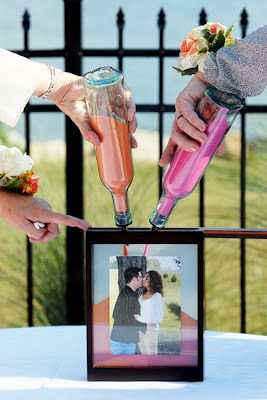 Every day people are creating new ideas of fun things they can have at their wedding. New twists on older ideas. Instead of lighting a candle you could pour sand in a glass picture frame. You could put one of your engagement photo's and have something engraved onto the frame. Have your favorite color and your soon to be husbands favorite color and poor them together into the frame. This is another great idea for couples who are remarrying and have children from previous marriages. Have each person take a color and one at a time poor them into the frame. Another great idea is to plant a tree during the ceremony. You could set some dirt aside, water and have some shovels. 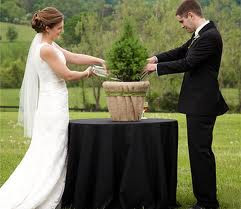 Your guests can watch you and your husband plant a tree together. Later you and your husband can plant the tree at your home together. This is a great reminder of your wedding day that you can see every day. There is a trend that seems to be taking the fashion world by storm and everyone has got the fever. It's all over the magazines, Pintrest and Wanelo and it doesn't seem to be leaving anytime soon. It's Ombre and its starting to take over the wedding scene too. 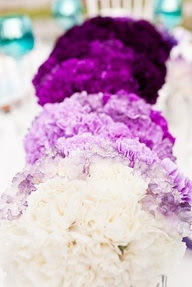 Center pieces can incorporate this trend too. 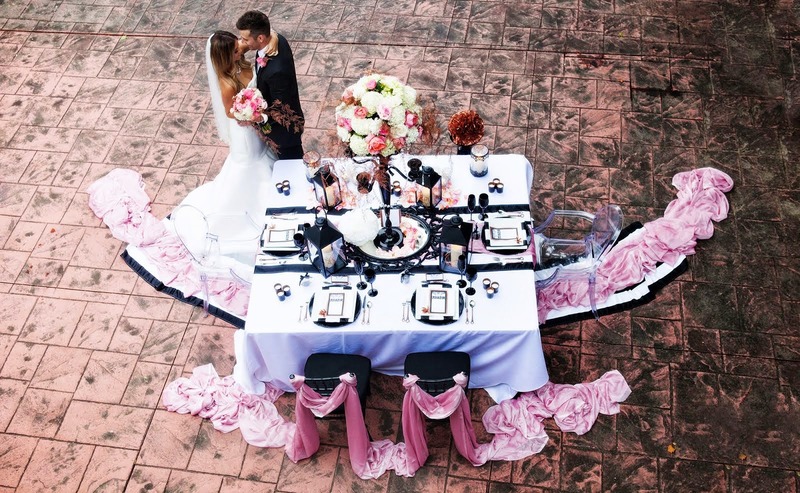 Many of the brides that choose to add ombre include it in their center pieces by using light to darker colored flowers of the same color on the tables. It looks really elegant and modern at the same time and makes your colors pop. 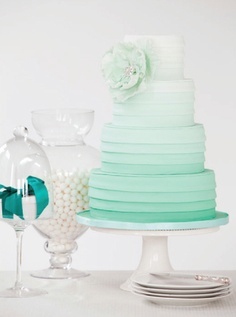 You can even make your wedding cake ombre. If you're feeling bold why not add your colors to your cake in an ombre fashion. The look comes off as elegant and fun, and your cake will be like nothing else the guests have ever seen before. Times are changing and weddings are taking a new turn. New creative ideas are forming and the first look is the newest! Not seeing each other before the ceremony is tradition that has been in weddings for decades. But now a new tradition is taking its place, the first look. The moment you see each other for the first time emotions are rising. The first look is a great opportunity where you and your partner can see each other for the first time without all of your friends and family around. Plus this is a great photo opportunity. Some people say the first look takes away from the ceremony, once you see each other then everyone can embrace the moment with you. But why not make it personal I know I want to. Here are some photos of people who decided on the first look! Put your own creative twist on it and add some balloons to make a more dramatic affect! Put a blind fold on him or meet each other on a street corner! While trying to think of what would be a great topic to write a new blog post about, I found myself staring blankly in front of my computer with My Big Fat Gypsy Wedding reruns play on my TV in the background. I was at a loss until I saw one of the brides attempting to use the ladies room in her giant dress. Thats when it hit me, what is the best way to use the restroom in a wedding gown? Now although your dress may not be as big as some of the dresses on said TV show, it can still be nerve racking to think of how you are going to be able to go to the bathroom in a dress you spent lots and lots of money on and that is probably bigger than a sundress you might have gone into a public restroom in before. Below I will discuss some of the tips I have found while doing a little bit of research that should help you out when mother nature calls. First thing is to scope out the restroom at your venue. If it is dirty ask the staff if it would be possible to clean it. You defiantly do not want to have the bottom of your dress getting gross from it hitting the floor of a dirty bathroom. 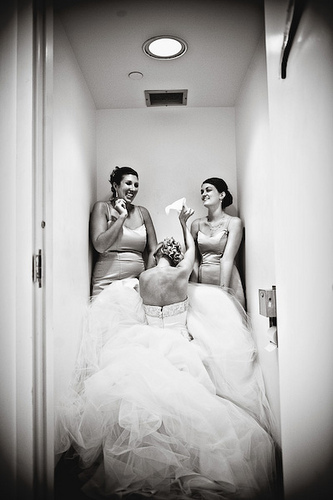 When it comes to actually answering mother natures call, it is suggested that you use the handicapped stall and bring some of your bridesmaids to help you hold up the dress. Once in the stall its important to completely remove undergarments and sit on the seat backwards, this way you wont have to worry about the back of your dress. Have your bridesmaids hold the back of your dress and when you are done with your business step backwards carefully. 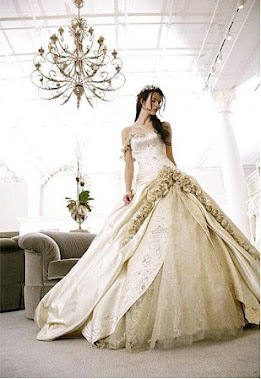 If you have a hoop skirt or a lot of crinoline under your dress make sure to not step on it when getting off the toilet seat, it could cause you to fall backward onto your back. And if all that sounds like just too much work, check out our blog on Bridal Diapers here! When creating your perfect wedding day sometimes it hard to find the exact items you have in mind. When picking out flowers, center pieces and accessories you as the bride want to make sure these items match your color scheme or theme. You might be asking yourself how do I go about finding these essential accessories and have them match my color scheme or theme. Here at You're The Bride we say why not make these items yourself! Here are some great ideas you can try out on your wedding day for your accessories. Go to a local craft store and buy RIT dye. 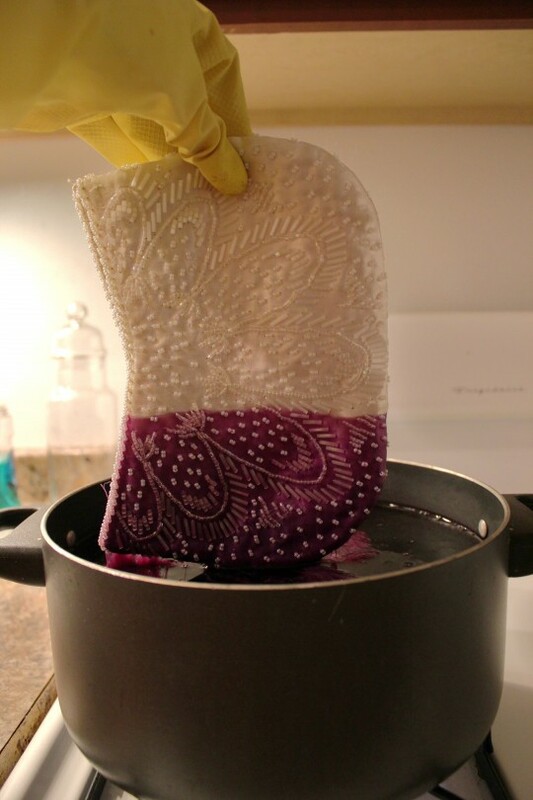 This dye will complete dye anything you need! Any abstract color you might have RIT will have the dye for it. 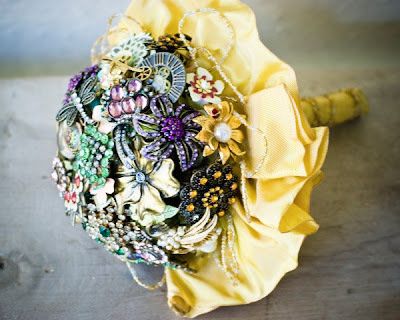 Another great idea if your having a vintage theme or an old Hollywood theme is a brooch bouquet. This is a great idea if you have a broches around your house. 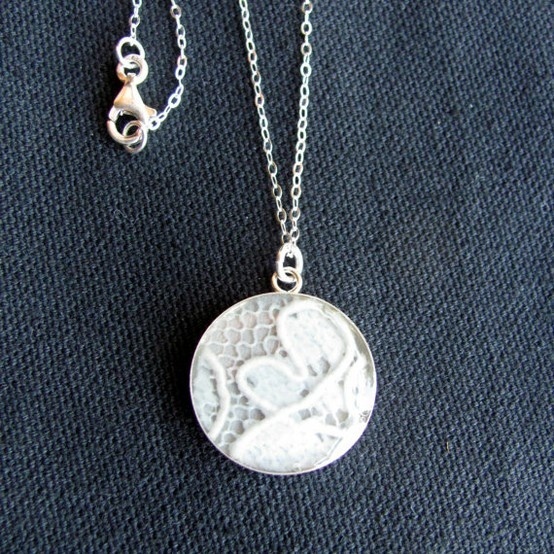 You can even find them at antique shops or resale shops. If you put your mind to it then you can create anything! Have you heard about Wish Upon A Wedding? 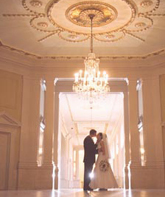 Do you want to get involved with helping a happy couple have a perfect day just like you did? 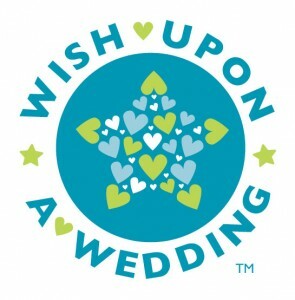 Wish Upon A Wedding is a a nonprofit organization. 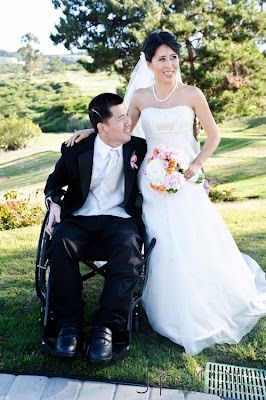 This organization is the very first that helps grant wishes to people how are getting married or renewing their vows. Wish Upon A Wedding started granting wishes in 2010. Ever since 2010 they have granted about 48 wishes. These wishes included one person in the couple who is ill, sometimes terminal preventing them to afford a wedding or a vow renewal on their own. Below is a link where you can see all of the people who were impacted by this amazing organization. 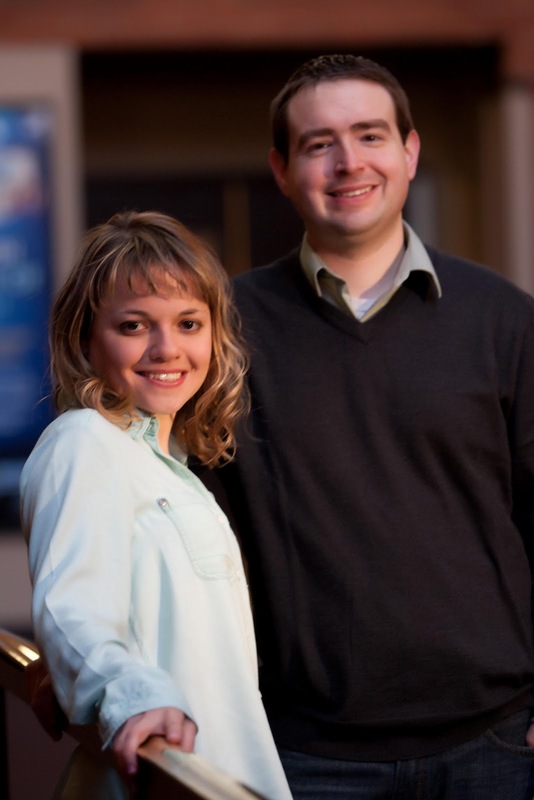 Each couple has an inspiring story they wanted to share! If Wish Upon A Wedding grants your wish this is what they include a wedding planner, caterer, rental company, photographer, videographer, cake, officiant, florist, stationery designer, DJ/musicians, hair & makeup, and transportation. On the link below you will find ways where you can help donate and submit a request for a wedding. 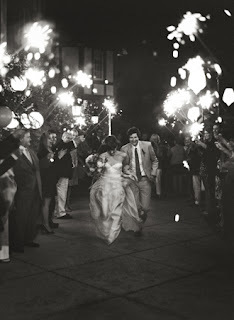 Many elements go into your wedding day, but there are only a few things you as the bride and the groom walk away with. 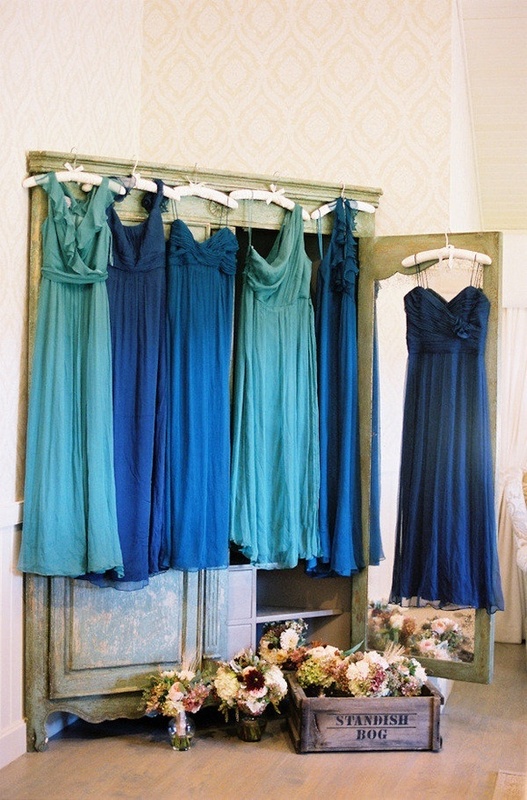 You walk away with the memories, photographs, guest book, presents and your wedding dress. All of these elements are easy to preserve but one, your dress. You can always go the classic way of getting the dress persevered so in a later date the dress doesn't fall apart and turning yellow. After getting your dress preserved you, your husband and other friends could go on a trip and wear your dresses around the town. 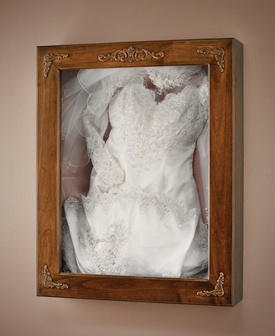 A bride can get her dress preserved and then put it in a shadow box on display for all her friends to see. Also, she can look at her dress and remember the day she wore it. Other creative ideas if you don't want to preserve the dress is you could cut a piece of the material and attach it to a necklace, this way you can always carry this special day with you. Giving your guests a gift is a subtle way to say thank you for sharing this day with us. There are many creative ways you can say thank you to your guests without making the gifts tacky or cheesy. When choosing a gift to give to your guests you want to make sure they tie into the theme of your wedding if you have one. You're The Bride recently went to a wedding where they gave can koozies as the party favor. 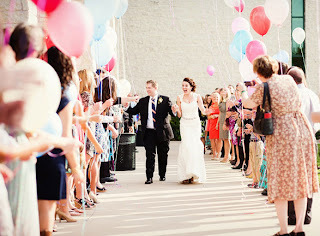 So you might be asking what are other cute ideas you could use for your wedding. 1. A bottle stopper is always a great way you can tie into your theme. Plus who doesn't love a great glass of wine! 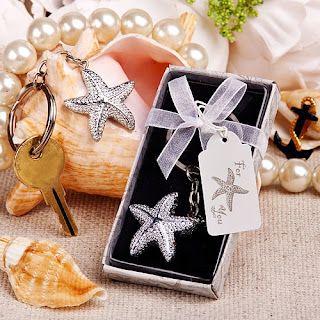 Another great and simple idea is a key chain. The picture below is great for a beach themed wedding. 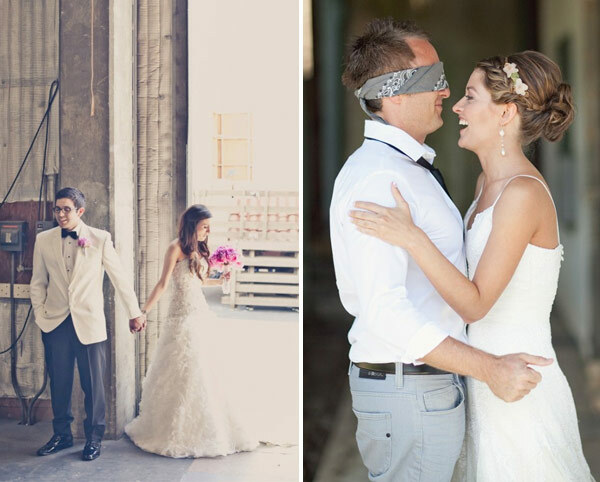 Both of these ideas can be easily crafted to match the theme of your wedding. 2. Another great idea is candy. This is a affordable way to say thank you to your guests. This can match any theme you might have. 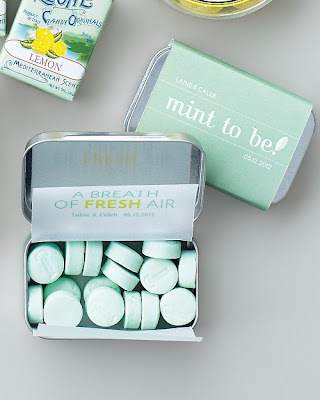 You can create a cute saying to put on the candy like seen below. 3. Lastly another great idea for a party favor for your wedding can be homemade jam or jelly in a mason jar. 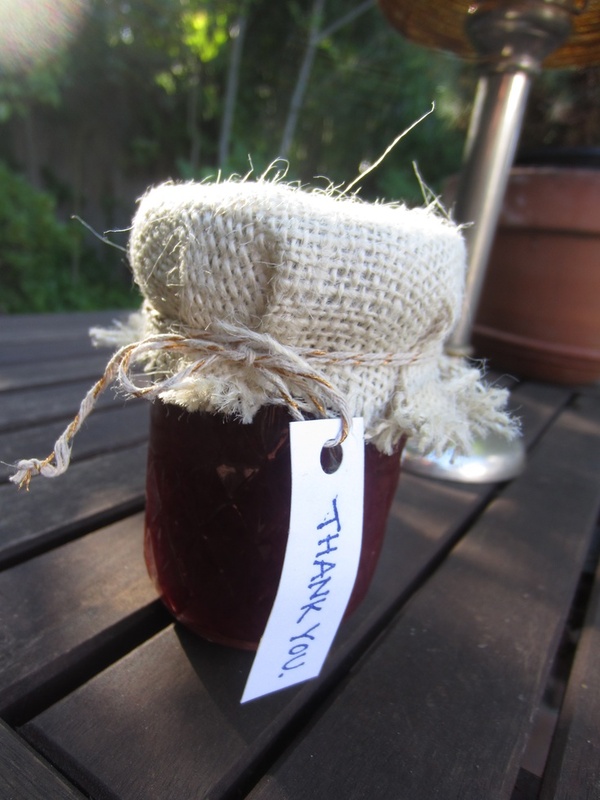 This is also an affordable way to say thank you to your guests. This party favor can be used in vintage themed wedding or a fall wedding. In a world full of technology it seems like there is an app for everything these days, including your wedding! These great tools can help you organize everything from your caterer to your guest list. 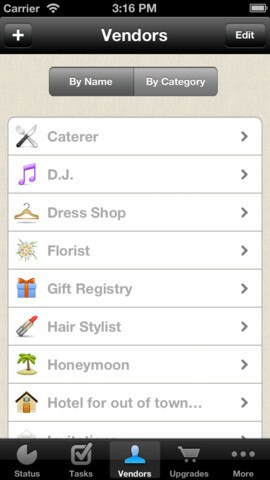 Here are some awesome apps for your smart phone that will help you prepare for your wedding day. 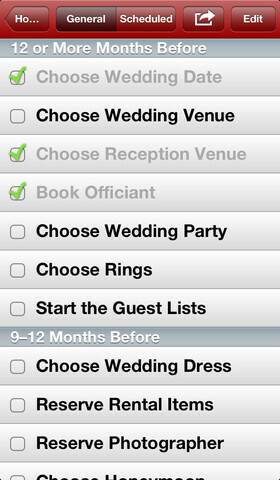 This app is awesome and includes a preloaded checklist, guest list organizer and countdown. You can record how many people you have invited as well as their response, to keep you super organized. 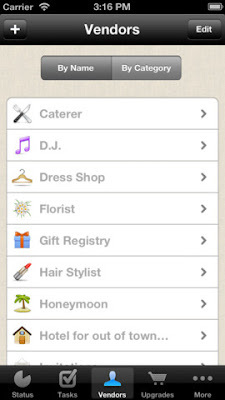 Wedding Happy is a great app for the bride who needs help with when to plan what as well as keep her organized. This app has a feature where it asks your wedding date then creates the perfect timeline for when to book vendors. It also keeps vendor contacts in the app so you have them all in one place. This look book is perfect for the bride struggling to find her dream dress or the bride who wants to preview dresses before she goes shopping. The app adds together information from you bust size, body type, height and personality to find the perfect dress for you! Peplum is all the rage right now. Fashion critics completely ate it up during this season’s award shows. They oohed and awed over each one and soon after peplum was everywhere. The great thing about this style is that there are so many different ways it can be designed. This means no matter what your style is, there is a peplum gown for you. The key is to know how to wear it so that you can look fashionable and yourself on the big day. Here are some tips for when you’re picking out which peplum gown best fits you. If your style is more classic and low key then choose a plain skirt and pair this with a top that has a belt, embroidery, or even a dramatic neckline. It will be subtle yet elegant in a classic Hollywood way. If your style is more daring and dramatic there are peplum dresses for you too. 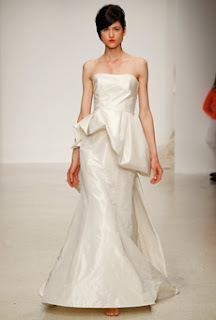 Try pairing your peplum top with a tulle ball gown. You don’t need to stick to the classic fit and flare style with your peplum either. Explore different options like bubble or draped peplums. When it comes down to it, this is your big day and you have ever right to dress absolutely fabulously. You are the movie star on the red carpet. Apart from the fact that they are so stylish and flattering, the great thing about peplum is that you can really use it to show off who you are and what your style is. "My name is Tania D’Agostino and I work as a pre-school teacher in Livonia for children ages 3-4 years old, I love what I do. 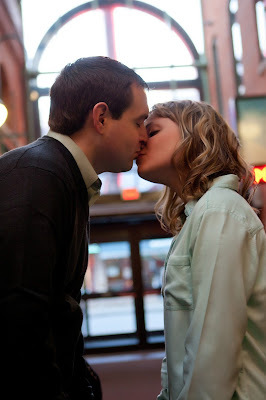 In 2007 I was working at the Redford Grill restaurant where I met my fiancé Dan. Dan’s friend Robbie brought him up there to eat one evening because Robbie’s Aunt was an owner of the restaurant and Robbie also worked there. Dan didn’t say anything to me that night, but after he left he asked Robbie about me because he thought that I was very pretty. Robbie told Dan that he hadn’t thought about it before, but that we would be perfect for each other. Robbie’s Aunt told me that Dan was a really nice guy who had been in the army. Robbie gave me Dan’s phone number and I texted him a couple days later and he called me. We began to talk constantly after that and soon we went on some dates. At midnight New Year’s Day 2008 Dan asked me to be his girlfriend as we rang in the New Year and I said yes. At the end of 2011, Dan and I were on the internet one evening looking for something to do on New Year’s Eve and we decided to see what the different prices were for hotels around New York during that time; he suggested that we go to New York to watch the ball drop in Times Square since he had some time off of work. I thought it would be a fun new experience and it would be nice to spend the time together, so we went. On New Year’s Eve, Dan and I found a good place to watch the ball drop. We had to stand in the same cramped area for around 10 hours, which wasn’t as much fun as it looks on television every year; but that year the weather was great and I was with my handsome man, so we were comfortable and happy together. The slight discomfort of standing around for all that time became worth it as the ball came down and everyone shouted and cheered, it was an amazing moment. After the confetti dropped we headed out of our confined area toward the sidewalk. We had to climb over a metal barrier to get to the sidewalk; Dan jumped right over and I struggled to get over, but someone else helped me. I was a little frustrated at him for not helping me over the barrier, but I didn’t realize that while I was struggling he had handed his camera over to a police officer. When I came over to Dan I reached into his pocket to grab my cellphone which he had been carrying for me, but I also grabbed something else out of his pocket that I didn’t recognize. Dan must have been too excited to notice this because after I pulled out the two items he backed up and reached into the pocket I had just explored. He didn’t seem to find what he was looking for. In his nervous and excited state he couldn’t hear me asking what the item was that I had pulled out of his pocket. He frantically began searching every pocket and he looked all around him in a panic. He stopped for a second and the police officer holding his camera said “Maybe you should look at what is in her hand.” Dan was finally relieved as he took the box and got down on one knee. He said to me “Babe, I love you so much, will you marry me?” He opened up the box and there was a beautiful ring waiting to be put on. My answer was a definite yes! I was so surprised and speechless. I feel so happy and blessed to be the one to marry him. I called my family that night and everyone was so happy!" The happy couple are getting married on September 14th at the Calvary Missionary Church in Livonia in front of 200 guests. Tania has four bridesmaids and Dan has four groomsmen. 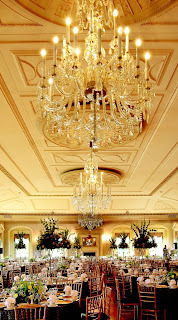 The reception will be held at the Italian American Center in Livonia, MI. Are you planning rice or bubbles for your send off? Why not try something new to make your send off different than all the rest. There are so many choices these days to make you send off fun and unique that you can leave the rice and bubbles behind. If your wedding is at nighttime sparklers are the perfect send off. The add a magical feel to the grand exit and look beautiful in pictures. My personal favorite is the idea of throwing lavender instead of rice. It smells wonderful and is perfect for spring and summer weddings. 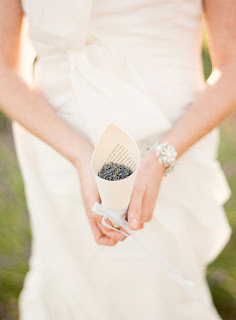 Just think about how amazing it will be to smell lavender later in your marriage and remember how happy you were in that moment when you walked out of your wedding as a married couple. 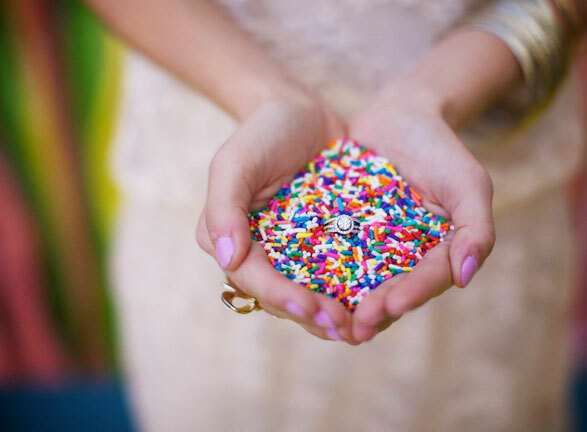 A colorful and fun way to exit your wedding is by using sprinkles instead of rice. Its such a great alternative to rice because it is a similar consistency to rice but with more color. Who needs bubbles when you can have balloons? This idea is for your guest to all get helium filled balloons and then when you walk by them they let them go into the air. This send off is super unique and everyone will remember it for a long time after your day is over. 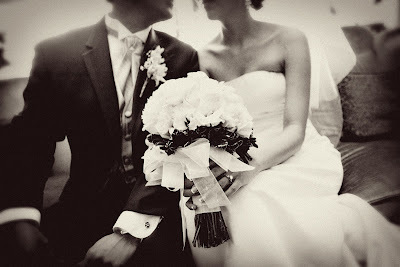 Before you tie the knot, a bride always wants to know if he is the perfect man for her. It is important to ask certain questions to your potential spouse. 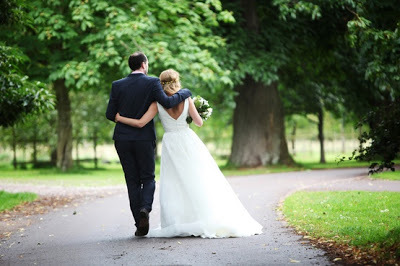 Before you take the next step you want to make sure you and your partner and 100% compatible Here at You're The Bride we believe it is important for you to find the perfect match. 2. How many children do you want to have? 3. List 5 things you might consider baggage. For example: I leave my socks laying around the house. 5. What is your favorite meal/food? 6. What are 3 fears you have? 7. List 5 weakness you have. 8. What do you believe is the most important attribute for a relationship? 9. Do you have a strong relationship with your family? 11. What are your top 5 pet peeves? 12. What is your favorite type of music? 13. Are you looking to move in the future? 15. What chore do you hate to do around the house? 16. Who is your hero? 17. What is the best advice you could pass down? 20. What is your favorite part of your body and why? 21. What is the most unforgivable thing you can think of? 22. What is your communication style? 23. What is one famous person you would want to meet? 24. What do you want to accomplish in a year? 25. What is your favorite color? Based off the answers your potential partner gives you can decide if you two are compatible with each other. These questions will bring you two closer together. This way can share stories and get to know each other even more. You can laugh at the memories you share, and fall more in love with each other as each question is answered. Are you busy planning the wedding of your dreams, but are having trouble locating the perfect venue? Well the Henry Ford is a great place for any wedding. They have a place for both the ceremony and the reception. Who wouldn’t love getting married among historic artifacts? 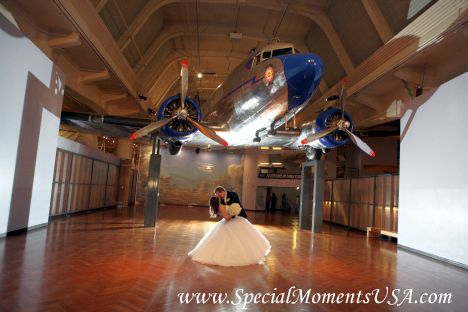 There are so many great opportunities at the Henry Ford that will make any wedding memorable. 1. They have a top rated onsite catering service, so no need to look for another vendor! They use only fresh ingredients from local farms. 5. Offer many extras, Coat check, tables (complimentary), security, piano, and valet! 6. Winner of awards 2007-2012 through the knot and many others! 8. The Museum offers discount group tickets for your guests to enjoy in between the ceremony and reception, or a great next day activity! So call today to get started on planning your wedding at the Henry Ford! Have you been asking yourself over and over again if Dad's Aunt Sally twice removed should be invited to your special day, or maybe that old friend from college? It can be hard decision especially if the possible invitees have family ties and sometimes just downright confusing who you should invite. Well here is a nifty little diagram to answer all your guest list woes. It will answer who is acceptable to invite, who you can definitely cross off the list and hopefully help you make your hard decisions a little easier once and for all.